Nestled amidst California's High Sierra peaks, two valleys have captured the imaginations of skiers and mountain explorers year after year. 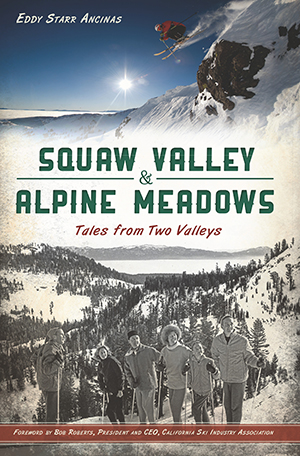 In this account, local author and longtime skier Eddy Starr Ancinas shares the histories of Squaw Valley and Alpine Meadows as they've never been told before, including the stories of John Reily, Wayne Poulsen and Alex Cushing, the visionaries whose dreams and determination forever transformed North Lake Tahoe. Squaw made a name for itself on the world stage thanks to its surprise nomination as host of the 1960 Winter Olympics. Meanwhile, just one mountain apart, Alpine was built with the support of local skiers and Bay Area families. Today, a new chapter unfolds as the distinct philosophies behind Squaw and Alpine unite under common ownership. Eddy Starr Ancinas is a world-travelled writer and longtime skier. She has written for various publications, including Fodor's. With deep roots in the Tahoe area, Ancinas serves as a board member of the Lake Tahoe Ski Club Foundation, Squaw Valley Community of Writers, and Squaw Valley Olympic Museum and Western Ski Heritage Center. Bob Roberts is the President and CEO of the California Ski Industry Association.